Dynamic Food Webs challenges us to rethink what factors may determine ecological and evolutionary pathways of food web development. It touches upon the intriguing idea that trophic interactions drive patterns and dynamics at different levels of biological organization: dynamics in species composition, dynamics in population life-history parameters and abundances, and dynamics in individual growth, size and behavior. These dynamics are shown to be strongly interrelated governing food web structure and stability and the role of populations and communities play in ecosystem functioning. Dyanmic Food Webs not only offers over 100 illustrations, but also contains 8 riveting sections devoted to an understanding of how to manage the effects of environmental change, the protection of biological diversity and the sustainable use of natural resources. 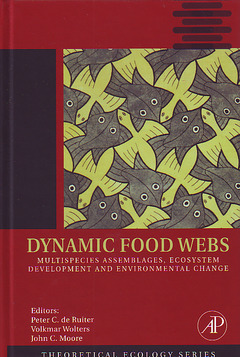 Dyanmic Food Webs is a volume in the Theoretical Ecology series.